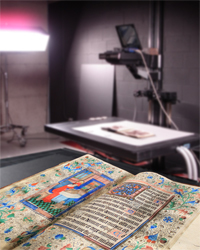 We’ve added 107 full colour issues of the McGill (University) Gazette. 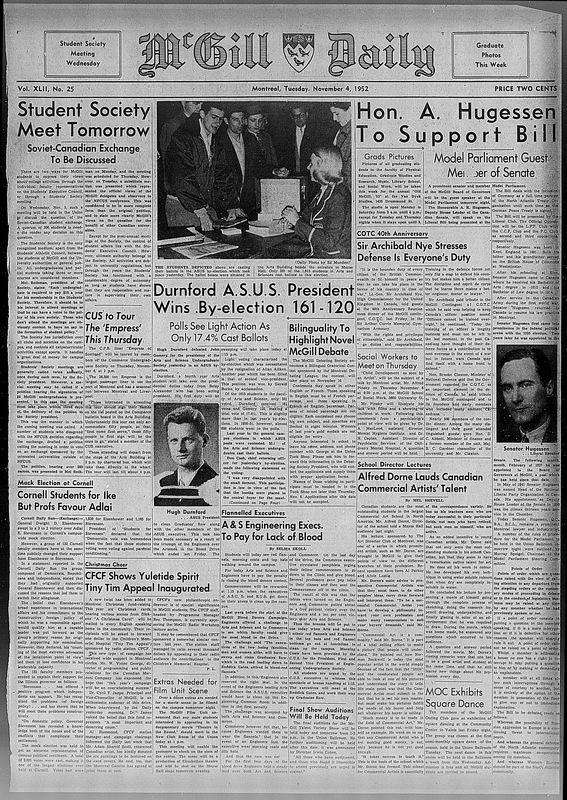 This semi-monthly is currently our oldest serial in our student publications digital collection. 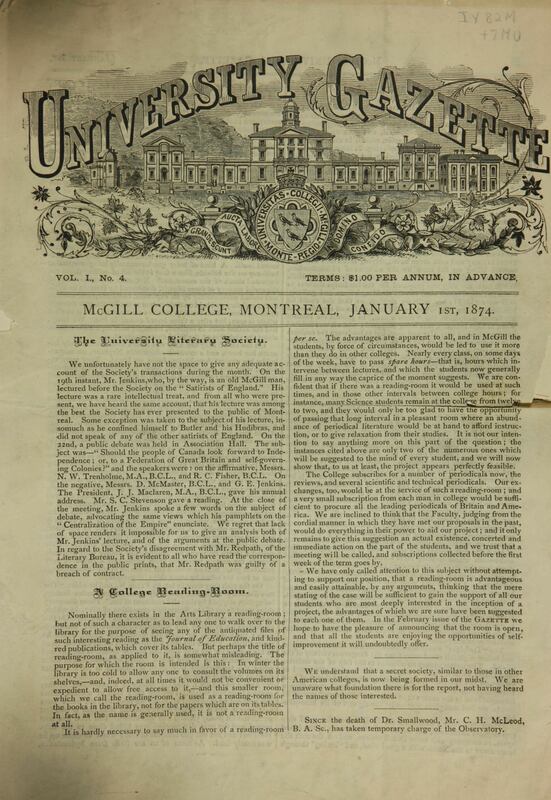 Published by the undergraduates of McGill University the Gazette requested contributions of tales, essays, and all suitable literary matter from University men and cost 1$ for a subscription. Our archival run starts with Vol. 1 No. 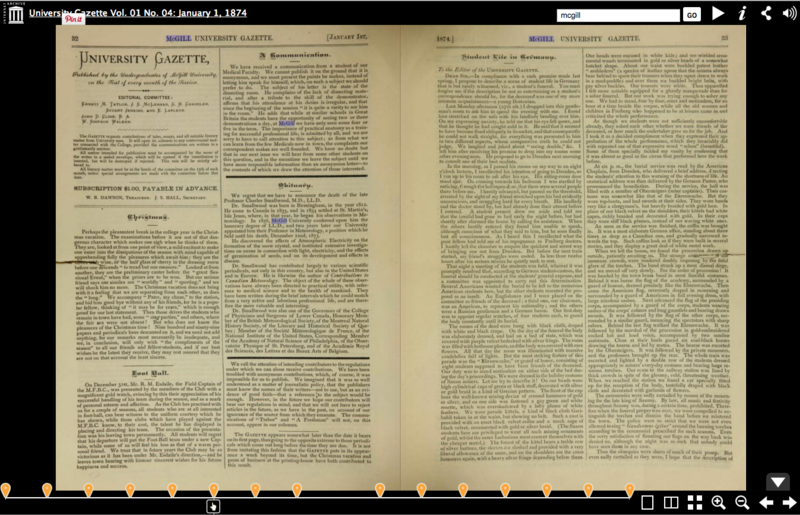 4 which was published on January 1st 1874. 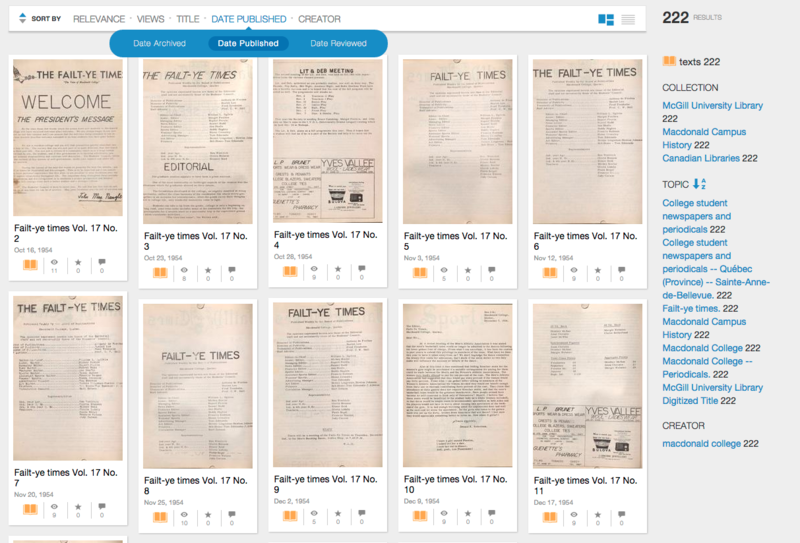 All of our student publications uploaded to the Internet Archive are also full text searchable. Learn more about what was happening in the past on campus by searching through our Student Publications digital collection that includes over 9,800 issues spanning the history of McGill from 1874 to 2001. What a difference a few decades makes. 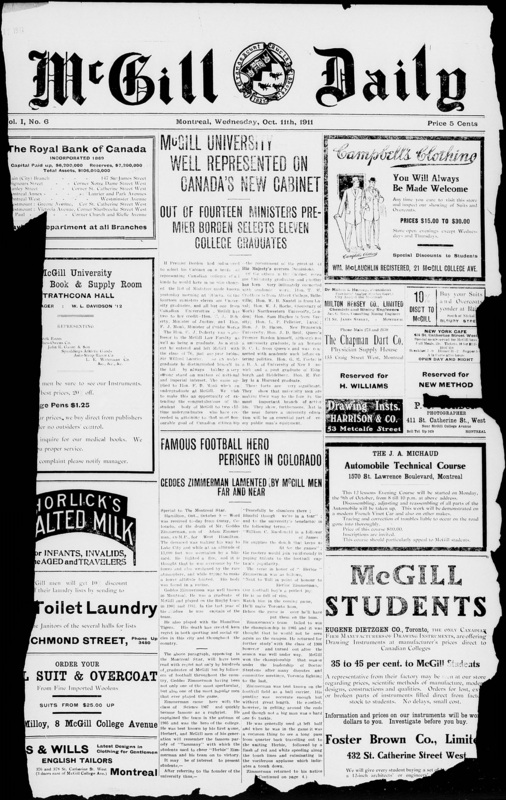 Click on the front pages of each paper to read the full McGill Daily issues from 39 years apart. Learn more about what was happening in the past on campus by searching through our Student Publications digital collection that includes over 9,800 issues spanning the history of McGill from 1875 to 2001. McGill University well represented on Canada’s new cabinet. Out of fourteen ministers Premier Borden selects eleven graduates. Click the front page to read more from the McGill Daily October 11th issue. On this day in 1898 the McGill Outlook published it’s inaugural issue and “makes its initial bow to the student public”. 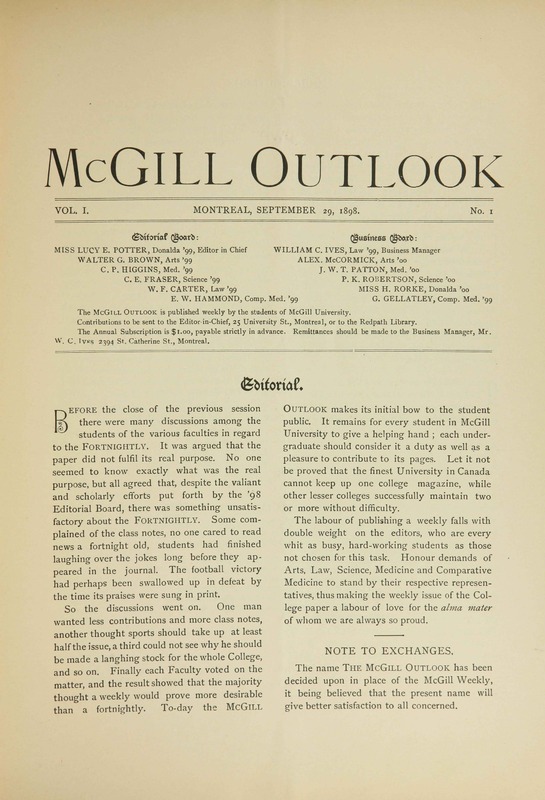 The McGill Outlook (1898-1907) was a weekly student newspaper that followed after the ending of the McGill Fortnightly (1892-1896) publications. Learn more about what was happening in the past on campus by searching through our Student Publications digital collection that includes over 9,700 issues spanning the history of McGill students writing from 1875-2001 from the McGill University Archives. 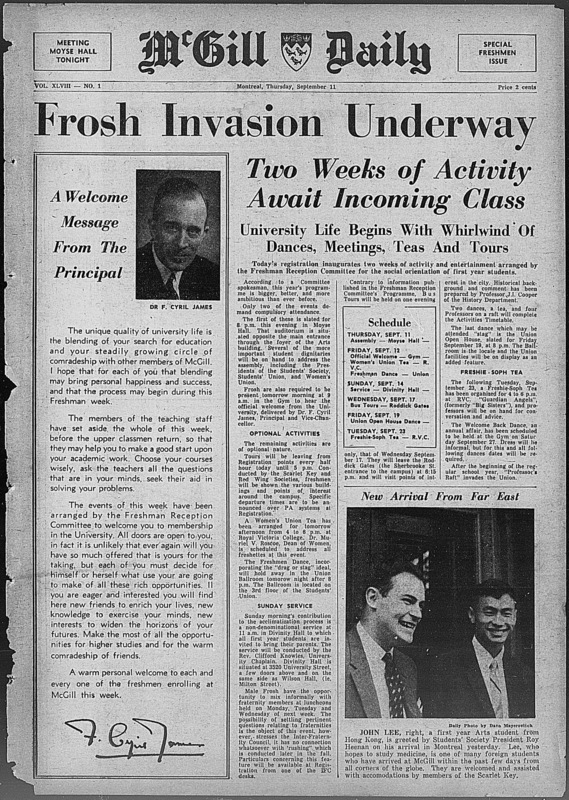 On this day in 1958 there was a ‘Frosh Invasion Underway’. Click the front page to read more from the McGill Daily Special Freshmen Issue. Learn more about what was happening in the past on campus by searching through our Student Publications digital collection that includes over 9,000 issues spanning the history of McGill students writing from 1875-2001 from the McGill University Archives. 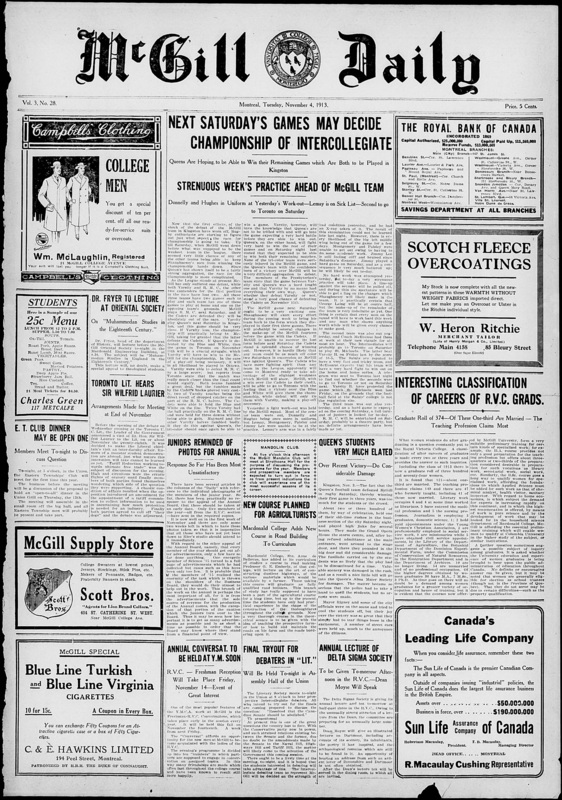 New to our Student Publication collection on the Internet Archive is 113 full colour issues of the McGill Outlook. This student publication was the successor of the Fortnightly (1892-1898) and appeared everything Thursday of the collegial year from 1898-1907. Issues includes reports from various student societies, class reports and advertising matter. 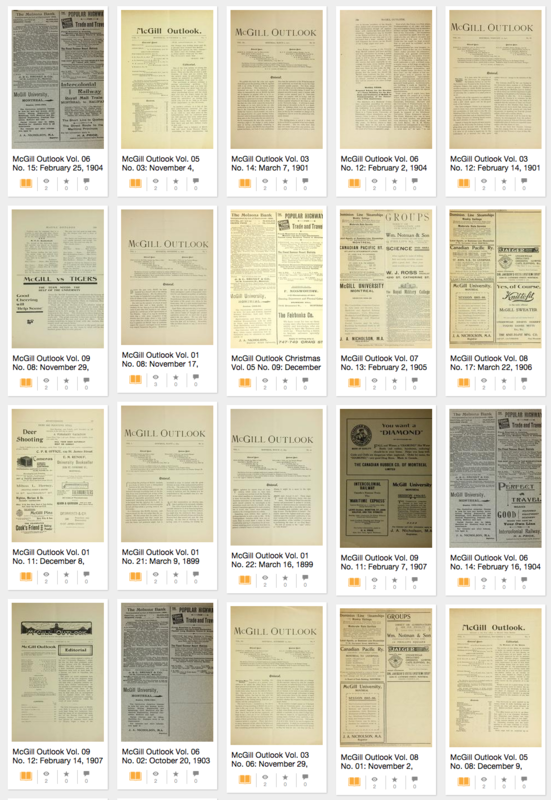 McGill Outlook collection of 113 issues.